Original and imitated phrases, repeated 4 or more times. Imitates other species, barking dogs, etc. 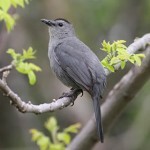 The spring song is sung only by the males, and may continue for hours, day or night. Both sexes sing in the fall. Description: Sexes similar. 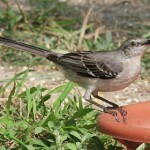 Dull gray above; paler below; black wings with two white wing bars, and white wing patch; black tail with white outer tail feathers. 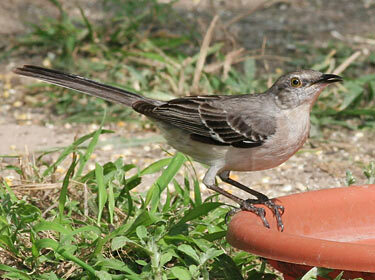 White wing patches and outer tail feathers flash in flight. Lacks facial mask. Behavior: Characteristic nervous sideways flicking motion of tail. Habitat: Found in a variety of habitats, including open woodlands, forest edges, farmlands, and cities and parks. Treeless plains and heavy forests are avoided. 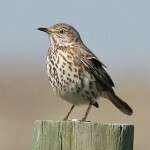 Where in Nebraska: Uncommon spring and fall migrant and summer resident in southern and eastern Nebraska, becoming rarer to the north and west. Fun Facts: A male may learn around 200 different songs thoughout its lifetime.